Place diced chicken and quartered large onion into a bowl with a splash of peanut oil and 2 tbsp Massaman Paste. Mix thoroughly until chicken is evenly coated. Leave to marinate for minimum half an hour. Thread chicken and onion onto skewers. For even cooking thread two pieces of chicken followed by two pieces of onion and repeat along the skewer. Set aside completed skewers in the fridge. In a hot heavy based frying pan, fry off finely diced onion and minced garlic in a splash of oil until well cooked. Add 2 tbsp Massaman Paste and stir thoroughly until paste is fragrant. Add peanut butter, coconut milk or coconut cream, and crushed peanuts and stir through. Incorporate water until the consistency is smooth. Leave to simmer on low heat until thickened slightly then turn off and set aside. Fry skewers on BBQ or frying pan until cooked through. Serve with peanut sauce and a crisp salad or rice. TIP! 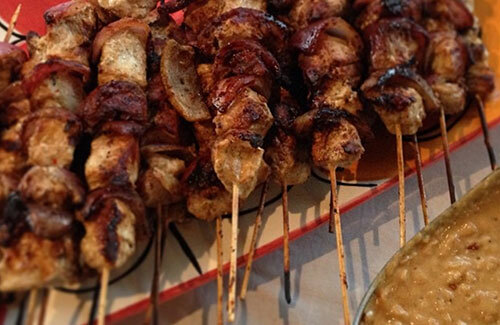 If the satay sauce thickens up a little too much while set aside during cooking of skewers, gently heat on very low and slowly incorporate more water until it returns to desired consistency.